DIAMOND BILLIARD PRODUCTS INC. is excited to introduce the new DIAMOND PRO-AM for the finest billiard halls and homes around the world. The PRO-AM is our highest grade commercial model table. 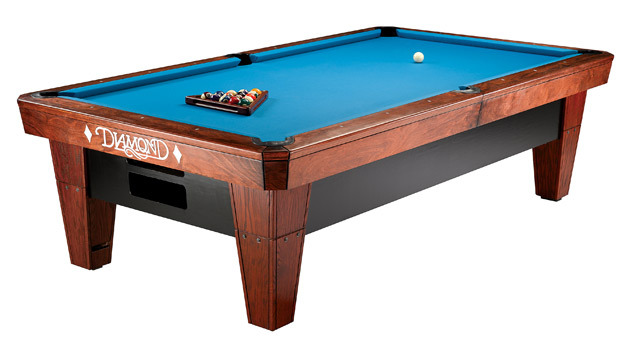 It is an extremely quiet ball return table that includes all the same features and playability of our DIAMOND PROFESSIONAL. The PRO-AM is superior in terms of construction, quality, and materials, but most importantly, it's playability is second to none. The main difference is the one-piece slate design featured in 7', 8', and 9' models. The PRO-AM has rapidly gained the respect of the professional, amateur, and casual players everywhere. Call +358 40 5391 754 for or multiple table discounts with or without matching light units and special pricing on Tournamanet Used commerical tables (when available). The Pro-Am can be FULLY assembled (except the legs) at storage before shipping.